Alpacas breed once a year and can be bred at any time of year. Baby alpacas are very sweet, called crias. Here’s what you need to know about alpaca husbandry. The alpaca has a gestation period of anything from 242 to 345 days, a surprisingly broad spread. They only have one baby at a time and they’re always born between late morning and mid afternoon, probably because that’s when the air is at its warmest on the high altiplano of the Andes where they come from. The alpaca birth process can take up to seven hours, and the baby cria can weigh anything from 18 to 20 pounds at birth. It is weaned within 8 months, sometimes as early as six months old. You can breed a female alpaca from a year old to 15 months of age onwards, but males take longer to mature and won’t be able to inseminate their female counterparts until they’re at least 30 months of age, sometimes as old as three years. Every alpaca needs regular vaccinations, worming and extra vitamins. But there are no specific products designed for the animals. Luckily they’re so popular in the UK that your vet should be able to help and advise about suitable drugs and medicines for your herd, as will the breeder you bought the animals from in the first place. 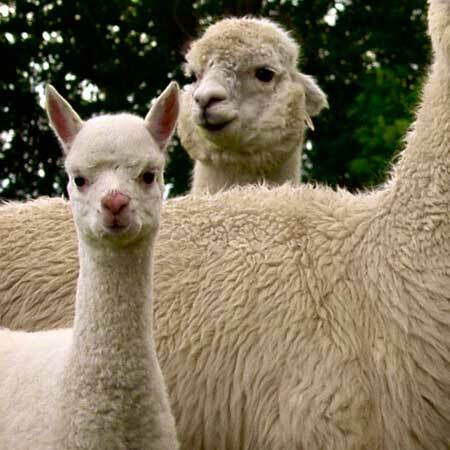 Clostridial diseases can kill baby and young alpacas. Many people use Lambiva to vaccinate the mother 6 weeks before the birth. When crias reach 6 moths old, they can be vaccinated in the same way as adults. Worms are an issue, causing all sorts of health problems. It makes sense to have a plan, a routine to follow to keep worms at bay, in exactly the same way as you’d have a worming plan for your dog or cat. How do you know there’s an issue with worms? We use dung testing of the paddocks, and we dose the entire herd each spring and autumn. It helps if you change worming products, using a different one each time in case the worms develop resistance. If you notice worm problems post-shearing, you can use a pour-on de-wormer. If their fur is long, a pour-on won’t penetrate and you’ll just waste your money. Bear in mind that mills sometimes reject fleeces if there are traces of chemicals. In the winter alpacas benefit from a dose of Vitamin AD&E, which you can either give orally or with an injection. This is because their fleece is so thick and impenetrable, which means they don’t tend to get enough natural vitamins from the sun during our short winter days. We breed alpacas, working on the basis that quality is better than quantity. If you’d like to pick our brains about how to breed healthy animals, we’re always happy to talk.